On Saturday, March 9, 2019, at SXSW, I took part in a press roundtable with director Alex Gibney, along with producers Jessie Deeter and Erin Edeiken, to discuss his latest documentary, The Inventor: Out for Blood in Silicon Valley (which I reviewed at Sundance). As are many of Gibney’s films, The Inventor is a profile of a brash, ambitious personality undone by hubris. 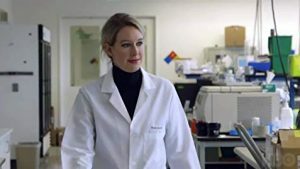 Here, we meet Elizabeth Holmes, founder and CEO of the now-defunct Theranos, a tech firm that promised a simpler way to test blood and failed miserably at that promise, jeopardizing the health of its customers in the process. Holmes saw herself as equal parts Thomas Edison and Steve Jobs, but was really mostly just huckster. Made with Gibney’s usual intricate layers of detail, the movie offers a damning portrait not only of Holmes, but of the vast array of supporters who looked the other way as her company faltered. We are all culpable in the scandal, as is so often the case. What follows are selections from the roundtable, edited for length and clarity, with questions from other journalists labeled as such. Alex Gibney: (laughs) I wouldn’t have a career if it weren’t for that! HtN: Exactly! So, what draws you in to the stories you tell, whether it’s this, whether it’s the Lance Armstrong doc, Enron or the Netflix series Dirty Money? As you juggle your many projects, how do you decide which one to tell, at any given moment? AG: Honestly, a lot of it has to do with the notion of what is a good story. Because there are lots of examples of hubris everywhere, all the time, but not all of them are really great stories. (laughs) This was a great story. When somebody showed me the book The Smartest Guys in the Room, about Enron, people were aware of what had happened at Enron, and for them it was all about the numbers. When I read the book, for me it wasn’t about the numbers, it was about the people involved. The characters were just larger than life, who seemed to inhabit this world of Greek tragedy…and hubris. And they were also wildly funny. So that’s what made we want to do the story, and not just that a big company had gone down. Other Journalist 1: Were any of the silent-film clips shown in your film recreated? AG: No, those are all Edison films. That was really fun. Once we opened the door to Edison, to be able to then start using all those Edison films was great, because they were all available from the National Archives. OJ1: Didn’t Edison have a film where they electrocuted an elephant? AG: Yes. I don’t think Edison asked them to electrocute the elephant, however. They were going to do it, anyway. OJ1: There’s also a lot of footage of Elizabeth walking down the hallway. How did you acquire that footage? Was that shot by her PR firm? AG: Some of it was shot by news crews, but a lot of it was shot by…they set up their own unit inside Theranos to document the glory of the company. I think the thinking was that if only there had been a camera in the garage with Woz [Steve Wozniak] and Steve Jobs, wouldn’t that have been great? So, this was the camera in the garage. And there was one character who did it for a while, and then they brought Errol Morris in to do it. So they were shooting a lot of stuff, including those company meetings, for example, where Sunny [COO Ramesh Balwani] leads everyone in the “f*** you” cheer. That was all material that we were able to get our hands on in the process of doing the film. OJ1: Was she from a wealthy background? How did she hook up with all these people like George Schultz, and Clinton? Was she already sort of in the door of society, so to speak? Jessie Deeter: Her mother was a lobbyist, known for cultivating any political angle and person she could. So it came out of that. They had had a certain amount of wealth, as well, so the story goes, and then lost a lot of it. And the father, ironically, had also worked for Enron, back in the day, too. Other Journalist 2: So, would you say that Silicon Valley learned any important lessons from this experience? If so, what can individuals do, based off of these lessons, to avoid being swept up in cons like this? AG: About the first question, I don’t know. You’d have to ask Silicon Valley. (laughs) I think that there is a tendency in Silicon Valley to believe that Elizabeth was just a bad apple in an otherwise pristine barrel. I don’t necessarily share that view. So, you’d hope that some lessons had been learned. And, you know, there are a lot of people who kicked the tires and did not invest in Theranos. But this whole idea of fake-it-till-you-make-it, and also that Silicon Valley can move fast and break things, in any realm, is a problematic idea, I think. When it comes to health care, you need rules and regulations to protect consumers, or when it comes to public spaces, or in the broader sphere. Now people are really beginning to understand what Facebook and Google and others are doing, in terms of mining our own data. So, yes, I would hope that Silicon Valley, writ larger, would look at this and learn some lessons. In terms of preventing the next con, what was instructive about this one was you had a journalist who came in from the outside, who was given a tip; you had whistleblowers from inside the company. By and large, our society doesn’t do a very good job protecting whistleblowers, and it was very hard for them to come out. I think, also, that Theranos tried to find a gray zone between two overlapping regulators, and some of the regulators had been weakened in the past by industry groups who insisted that LDTs, or Laboratory Developed Tests, would not be rigorously regulated and that people should be able to do their own. So, you see all these economic pressures build up over time in ways that are not necessarily protective of the public good. On a smaller note, in terms of detecting stuff early, look at the system we have now. We have these rigorously enforced NDAs [non-disclosure agreements], which are supposed to be about protecting trade secrets, but are really about protecting sexual abuse and fraud. Something’s got to be done to undercut the power of those NDAs in the context of some kind of public interest. HtN: You earlier mentioned Errol Morris, who shot a commercial for Theranos, and didn’t have the benefit of hindsight when he was making that ad. I think we all respect Morris’ career, but in your film, he comes across as a little naïve, given where you place him in the narrative. Have you heard from him? AG: I didn’t hear from Errol, but I did reach out to him, over and over again, and my cards and letters were not returned. Then, when I happened to bump in to Errol at an event where he was being honored, and I was giving a speech to honor Sheila Nevins, I said, “Hey, can we talk about this? I’m curious to get your views.” And I was half-hoping that he would sit down for an interview! I thought that would be interesting. But he said, “No, I’m not going to talk about it, and you can’t make me.” (everyone laughs) And then I followed that up by saying, “Well, how about we just have a chat, off the record?” And he said, “For God, there is no ‘off the record,’ and he can be a very unforgiving person.” (everyone laughs) That was vintage Errol Morris. Other Journalist 3: So, similarly, I wonder, if you had the chance to sit down and chat with Elizabeth Holmes, have you thought about what you would ask her? AG: Sure! I mean, Jessie sat down and did speak with her. AG: Going back to the whole Steve Jobs thing, it’s interesting that the one lesson that she never took from Jobs was what he learned from his biggest failure. Because I think Steve Jobs 2.0 – the iPhone Steve Jobs – really comes out of failure. And it’s what he learns from failure, and suddenly surrounds himself with people like Avie Tevanian – who actually invested in Theranos and later pointed out her foibles – and Jon Rubinstein and…who’s the great design guy … ?HtN: Jony Ive? AG: Jony Ive! Those people were great at what they did and could also tell Steve Jobs “no” and they were a kind of feedback loop, and I think he learned to listen to criticism that was constructive. That’s incredibly valuable. But that’s not a lesson that Elizabeth learned. Other Journalist 4: Will Elizabeth ever do time? AG: Yeah. I think she will. I mean, I can’t guarantee it…(laughs)…but I think she will. I mean, the trial will be either later this year or possibly even as late as next year. It depends on what happens in some of the court conversations, but the charges could get her up to 20 years. I very much doubt, if she’s convicted, that she’ll do that kind of time, but I think she could do time. OJ4 (to Jessie Deeter): Could I ask what your impression was of her? Because it seems like women didn’t respond the same way as men did to her? JD: Well, anecdotally, my husband makes fun of me, because I like all my characters, even if they’re “bad people,” or they’ve done bad things. I really just like people, but I did find it difficult to relate to her as a person. The story goes that from a very young age, her parents pushed her to learn Chinese, and at one point, as I was fishing for anything we might have in common, I said, “You know, I wouldn’t have wanted to learn a language at that age, and my kids sure would never want to volunteer to do that. What’s up with that?” And she goes, (sotto voce) “I was a good girl.” And I was like, “Oh, OK!” (laughs). And the whole never blinking thing…by this point her PR person had been working on her, so she ate things other than the usual green juice, and she was wearing a blue shirt, rather than the black turtleneck, and not wearing any makeup, so she had been cultivating her image. But I would say that she wasn’t likable. And she was definitely on the offense, too, trying to get more information from me and sell this idea that Theranos was going to remake itself, and if we were so lucky, we could be right by her side, witnessing the process of this version 2.0. But I didn’t find her engaging as a person. JD: Not much! And with her voice, too, whether or not it’s an affect or not, she definitely carries through. Again, anecdotally, we’ve heard that the voice has changed. People who knew her in college, in the beginning, claim that that was not the same voice. Anyway, that’s what we’ve heard. Other Journalist 3: What’s interesting to me is that her comments about men being allowed to fail are sort of true. There are so many men in Silicon Valley who have been allowed to fail spectacularly. Have you thought about the flip side of it? It almost seems like she’s been through the centrifuge, and she’s being criticized in ways that others are not. AG: So, you’re asking, is her retort fair? You could say it, except that in this particular case, to say that people get an opportunity to fail…you know, if you’re making a smartphone, I think that’s a valid criticism, but in the case of Elizabeth, she was putting lives at risk. It’s a little bit different. So, I think she’s held to a higher standard because what she was trying to do relates to human healthcare. It wasn’t a gadget or a piece of software. One of the reasons that she got so much coverage, early on, was because people were invested in the idea of a female entrepreneur in male-dominated Silicon Valley and really taking it to the man. And in this case, I really mean “the man!” So, I think that was a really powerful and inspiring idea. But when you cross that ethical line having to do with people’s health, you can’t really hide behind that. HtN: So, Alex, I read that you’re now preparing to do your first narrative feature, The Action, and I’m wondering how the preparation for that is different than what you’ve been doing up until now. AG: So, it’s not my first time doing scripted. I’ve done some TV stuff, and directed the pilot episode for the series I did with Larry Wright called The Looming Tower. I also started out as a fiction-film editor. That said, I think that the documentary work I’ve done has a great influence on how I approach features, and in some ways – you could ask the actors with whom I’ve worked – I think it has a benefit, in terms of working with actors. You tend to pull more and push less, in terms of seeing what they bring to the table and finding a way to photograph it. So, I think that the documentary experience is a valuable learning area for how to direct features.